Are Player-Characters Blank Slates in DA:O? In her article, “Game Characters as Narrative Devices. 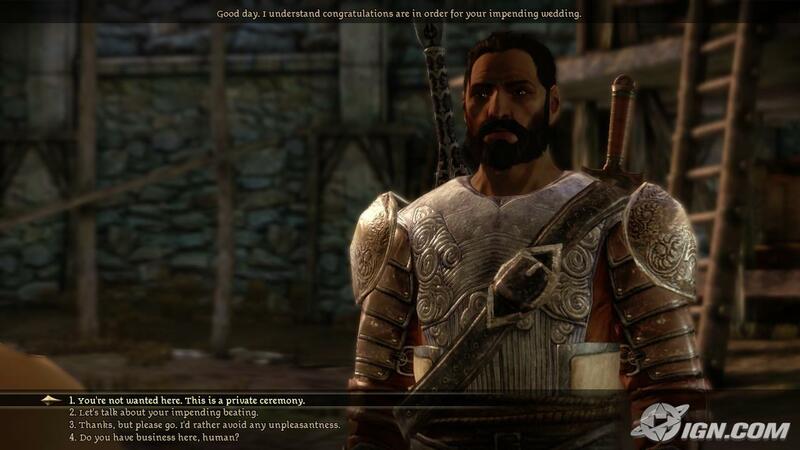 A Comparative Analysis of Dragon Age: Origins and Mass Effect,” Kristine Jørgensen examines the way that Dragon Age: Origins uses supporting characters to drive its plot. Namely, she claims the game leaves the player-character “relatively open for the player’s interpretation, only leaving certain clues that point in the direction of a fictional individual.” In other words, the player-character gets influenced by the situations affecting supporting characters, but how characters react to these scenarios though gets left entirely up to who the player thinks the player-character ought to be. I agree with Jørgensen that within the game “depth is hinted at in dialogue options, as each option reflects a different attitude and emotion, but it is up to the player to fill in motivations behind the choices that the PC is making.” The dialogue options give the players the ability to react to in-game events. They can threaten people they disagree with and get into fights, handle a situation rationally and peacefully, or try and bargain and make a profit. These choices then reflect back on the player’s perception of the player-character’s personality. The dialogue options include being polite or threatening. The player’s choice of dialogue then “forms” the player-character’s personality. I disagree though that the player-character “is more of a blank canvas that the players can add a greater variety of personalities onto.” For example, depending on the race (human, elf, dwarf) and class (warrior, mage, rogue) the player chooses, they may have limited options of origin story. If the player wishes to play a mage they get locked into the single mage route, a human non-mage also gets locked into a route. Only non-mage elves and dwarves have choices, and then they only get to pick between two options. These origins can shape the narrative and personality of a character. For example, in the human route, the player-character loses their entire family, while in one of the elf origins, a journey through the forest goes terribly wrong. Additionally, at times in the game, certain characters with the player-character as if they know them, even if the player has had no previous exposure to them. In the human origin, when first meeting the king he speaks with you as if he knows your family and you know him, despite the player having little information on the character. While it makes sense for the player-character’s backstory, as a member of the noble family, to know of the king, the player won’t have the information, making the scene strange. The player themselves doesn’t know the character, but is expected to based on the player-character’s origin. This makes the character less of a blank slate, and more of a structure already built but waiting to be finished. It gives the player freedom to flesh out the player-character, but only via a world that has already been constructed. Character origins gets determined by these choices, which then impacts what happens to the player-character, and therefore shapes their personality. JøRGENSEN, K.. Game Characters as Narrative Devices. A Comparative Analysis of Dragon Age: Origins and Mass Effect 2. Eludamos. Journal for Computer Game Culture, North America, 4, nov. 2010. Available at: http://www.eludamos.org/index.php/eludamos/article/view/vol4no2-13/192. Date accessed: 03 Oct. 2016.